St. Francis County was formed in October 1827, by the legislature of the Arkansas Territory, taking a part of Phillips County. It was named for the St. Francis River that flows across it. The landscape of the county is rich, flat farmland in the eastern and western halves and rolling hills in the center. 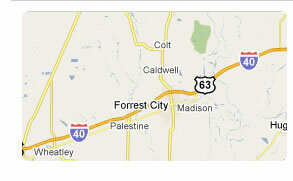 The county seat is Forrest City. Forrest City was named for Confederate General Nathan Bedford Forrest who was the contractor for grading the Memphis-Little Rock Railroad through Crowley’s Ridge. St. Francis County dependent on rural agricultural now has light manufacturing to help its economy. Crowley’s Ridge that runs through the county is noted for growing peaches and other fruit crops. East Arkansas Community College and the Crowley’s Ridge Vo-Tech both are located in County. St. Francis County is at the crossroads of eastern Arkansas. Both railroads and major highways lead east to Memphis, west to Little Rock, north to Jonesboro and South to Helena. Village Creek State Park has become the region’s top recreational place with almost 7000 acres on the St.Francis -Cross County line. Facilities include two fishing lakes, rental boats, trails, campsites, tennis courts, ball fields, swimming and golfing.